Senior Moving and Relocation: Our team in Miami proudly serve senior citizens transfer to Doral, Florida or into a new retirement community or assisted living facility in the area. We understand that the thought of leaving from a home you've lived in for many years can be overwhelming and intimidating. We make your transition as easy as possible with a full-service relocation program. Moving and Storage: Do you need to have your items stored before moving into a new home? Are you selling your home and need to declutter while your home is listed? You can count on Doral Moving Services for affordable care and storage services. When you store your belongings through us, we will inventory and store your belongings in crates that can only be accessed by our movers. We offer affordable climate-controlled storage that's secured by a 24-hour security system to protect your belongings from theft or damage. We offer stress-free door-to-door pick up and storage from your home to our storage facility and back again to your new home. With many years of experience, our personnel have the experience necessary to move specialty items that need to be packed and handled with care. We understand that a move often needs more than standard boxes and packing solutions. You may have heavy furniture that needs to be craned from a high floor, valuable artwork that requires special care, or instruments like a piano that need to be treated with care. We are equipped and trained for all types of specialty packing. Piano Moving: Piano moving in Miami requires special training and care. Whether you have an upright or grand piano, we understand that piano lifting can be complicated and, if special precautions aren't taken, can cause significant damage to your treasured piano. 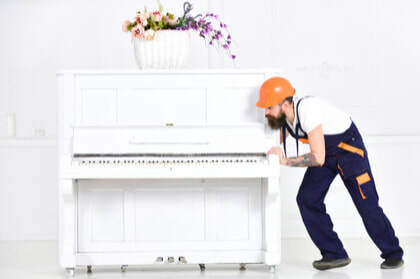 We offer complete piano care for all types of pianos, whether you are making a local or long distance move or you need your piano transported to a repair shop. We use special rigging and craning to prevent any type of damage to your piano during the move and transportation. Pool Table Moving: You don't need to leave your pool table behind when you move; you just need the right movers. Our company and staff uses specialized techniques to safely transport your pool table to your new home without damage. We will detach the frame, pockets, felt, slate, and table legs which will be carefully packed for the move. Once you arrive in your new home, we can even help with careful reassembly. Special Crating: For your fragile and valuable items, you shouldn't rely on standard boxes and packing supplies. These items should be handled carefully with custom crating to ensure they get to your new home without damage. We offer custom crating and care for all types of belongings, including items with awkward dimensions, delicate items, and valuables. Our movers can crate your flat screen TV, marble tabletop, valuable artwork, and more with crates built to the specific measurements of your items. Tricounty Service Areas: With many years of experience in the business we are sure that we can be on your budget. We covert all local Miami-Dade County cities, and Broward and Palm Beach counties. Here are some of the cities we cover in Miami-Dade county. Moving Should be easy, leave it in our trusted hands.